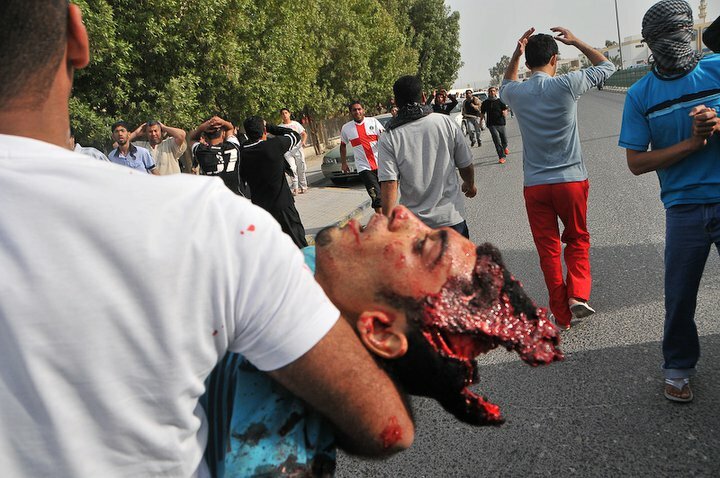 Bahraini man Ahmed Farhan was shot in the head by Saudi soldiers as he lay fatally wounded on the ground. He was singled out for the brutal killing simply because he was carrying the Bahraini national flag in his car, witnesses say. Thirty-year-old Ahmed had the misfortune of going to refuel his car at a petrol station on the outskirts of his hometown, Sitra, when it came under attack from heavily armed troops belonging to the Bahraini Defence Force and Saudi army. The soldiers, backed by armoured cars and tanks, were firing live rounds and raiding homes in the mainly Shia town in northeastern Bahrain – military operations that have become a daily event here in towns and villages across Bahrain. “There were other customers at the petrol station, but the soldiers noticed that Ahmed had a Bahraini flag in his car,” recalled a close friend. This was only 24 hours after thousands of troops from Saudi Arabia and other Gulf states arrived in Bahrain as part of the Peninsula Shield task force on March 14. The Bahraini government headed by King Hamad Al Khalifa declared then that it had called on neighbouring states to help it “restore order and stability” after four weeks of massive pro-democracy, and mainly peaceful, protests were threatening to topple the US-backed Sunni rulers. When Ahmed’s remains were viewed later in the morgue his body showed the signs of point-blank shooting. His back was riddled with shotgun wounds and when the morticians turned his body over, the back of his skull flopped open revealing a bloody mess and a gaping hole where the brain used to be. Nearly four weeks after the arrival of the Peninsula Shield forces, the military crackdown against Bahrain’s pro-democracy movement appears to be intensifying, with Saudi troops at the forefront of the assault on mainly Shia villages and districts within the capital, Manama. Some 31 people have been killed since the uprising began on February 14, two-thirds of them since the Saudi-led forces entered the country, according to the Bahrain Centre of Human Rights. More than 20 persons remain missing. The latest victim was named yesterday as Ali Essa Sager (31), from Sihlaa, who died in detention, believed to have been tortured. Over 600 people, including politicians, doctors and lawyers, are reported to be unlawfully detained in unknown conditions – the vast majority having been arrested since the Saudi forces came to Bahrain. In what appears to be a further sinister twist to the repression, several Shia mosques have reportedly been attacked by Saudi forces. Pro-democracy sources say the attacks on mosques are an attempt to incite sectarian violence between Shia and Sunni communities to provide a political cover for the authorities to escalate the crackdown against the pro-democracy movement and further tighten the state of emergency that was declared on March 14. The Shia represent 60-70 per cent of the Bahraini population and have been most prominent in calling for a democratically elected government to replace the Sunni ruling monarchy. As well as constitutional overhaul of the Persian Gulf island state, the Shia majority also complain of decades of discrimination in jobs and housing – grievances that are all the more amplified given the oil wealth of the tiny country of some 700,000 indigenous inhabitants. 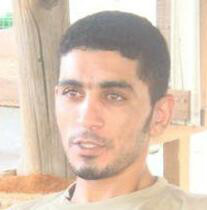 Ahmed Farhan’s family is typical of the poor social conditions endured by many Bahrainis. He shared the cramped, run-down family home in Sitra with his parents, four brothers and two sisters. The four adult brothers slept in one small room. One of his sisters is married with four children, who also live in the family home. Some 50,000 Bahraini families are estimated to be on a waiting list for affordable housing, many of them waiting for over 20 years to be properly housed. Ahmed worked as a fisherman. He earned 80 Bahraini dinars a month ($212), which is barely enough to cover the weekly food bill for a small family. Bahrain’s traditional fishing industry used to be a mainstay activity sustaining many communities. But the industry has been badly hit by large-scale land reclamation projects carried out in recent years as part of the island’s economic modernisation. Some former fishing villages, such as Juffair, have now found themselves in the bizarre situation of being landlocked, surrounded by skyscrapers and five-star hotels that cater for expatriate businessmen. The land reclamation projects are blamed for destroying fishing grounds and depleting fish stocks, which have in turn led to many fishermen losing jobs or, like Ahmed, trying to eke a living from diminishing earnings. Finian Cunningham is a journalist and musician: [email protected], www.myspace.com/finiancunninghammusic.